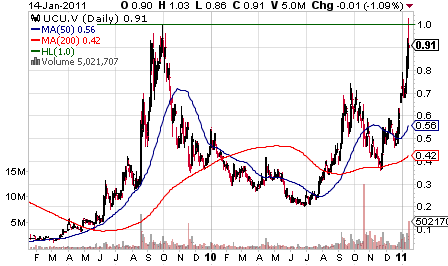 The uptrending Ucore Rare Metals Inc. (CVE:UCU) (PINK:UURAF) has stopped near the psychologically important resistance at $1. Heavy trading volume on Friday depicted indecision and profit taking as the price swung sideways for most of the day. The company's stock continues to attract the attention of stock newsletter providers. UURAF has been appearing in traders' in-boxes for nearly a week now, presented as having great potential in the rare earth metal market. The market that Ucore Rare is in seems to be the strongest aspect of the business at this stage. The company owns several uranium properties in Alaska. The most recent update on Bokan-Dotson Ridge project stated that surface trenching and channel sampling showed significant concentration of heavy rare earth minerals in the property. Exploitation of any of the properties is yet to be commenced though. The company hasn't published any updates since late December, thus the price should begin to correlate more strictly with the fundamentals. A $10 million financing completed in early December helped with the matter, but the market cap of over $100 million seems overextended when compared to the roughly $33 million net tangible worth of the business. Ucore hasn't made a dime to date, which is one of the key reasons why the share price cannot go an unwarranted blue skies breakout. According to the reports, China as the key supplier of rare earth metals to the U.S. will be shutting down its supply in the coming 3 to 5 years. That gives the company enough time to get into production and start generating value for investors, but short-term the market worth doesn't look adequate. Any idea why GWG-X, Great Western minerals lags the rest of the REE stocks?